Michigan coaches have been on the road for the final week of the July evaluation period — otherwise known as Las Vegas week. The Wolverines continue to track Cassius Winston closely, but also have been searching for additional point guard and wing guard options across the board. Michigan coaches have been on the road for the final week of the July evaluation period — otherwise known as Las Vegas week. The Wolverines continue to track Cassius Winston closely, but also have been searching for additional point guard and wing guard options across the board. Several Michigan targets were in attendance at the Nike Global Challenge last week and Draft Express, one of the top scouting outlets in the industry, shared their thoughts on several of them. Behind a 21-point, nine-assist effort in the third place game, Detroit-native Cassius Winston led the Nike Global Challenge in assists per 40 minutes (11.09) and Pure Point Rating (9.42). He showcased excellent vision, creativity and timing as a passer to go along with his ability to play at different speeds. The 6′ 2” lead guard can play pick and roll, distribute on the move, and really push tempo in transition. Winston didn’t quite have elite burst as he’s playing at a heavier weight than he has in the past (weighed in at 194 at 2015 Nike Skills Academy after weighing 173 the year before) but he’s still fairly shifty and was able to get into the lane and use his strength to finish through contact – 59.3% inside the arc. Winston still has room to improve as an outside shooter as he shoots a bit of a push shot with a low release point, but he displays nice touch despite the less than stellar shooting mechanics. There’s no doubt that Cassius Winston helped himself with his impressive playmaking and finishing ability in front of a handful of big-time college coaches. Canadian wing Christian David didn’t wow scouts, coaches or media with monster production, but at 17 years old (which he just turned on June 19) his size, frame, shooting mechanics, IQ and fluidity make him an interesting prospect to track moving forward. At 6′ 6” in shoes, David has solid height for a small forward prospect to along with wide shoulders, although he’s still fairly thin in the chest and lower body. David is a fluid athlete who proved capable of getting out in transition and playing above the rim while attacking the rim in a straight line. Although David can straight line slash, he struggles finishing at the rim as he’s fairly right-hand dominant at this stage and has a tendency to avoid contact in traffic. David should be able to improve as a finisher once he gains more experience and fills out his frame a bit. While his physical profile is decent for a wing, it’s David’s smooth shooting stroke that will be his moneymaker as it continues to develop with a few minor tweaks. David made only 4-of-17 threes at Global Challenge, but it was clear the potential is there. David’s size, fluidity, shooting stroke and IQ make him worth tracking as he continues to fill out and gain more experience. John Beilein watched four-star point guard Payton Pritchard multiple times this week in Las Vegas. 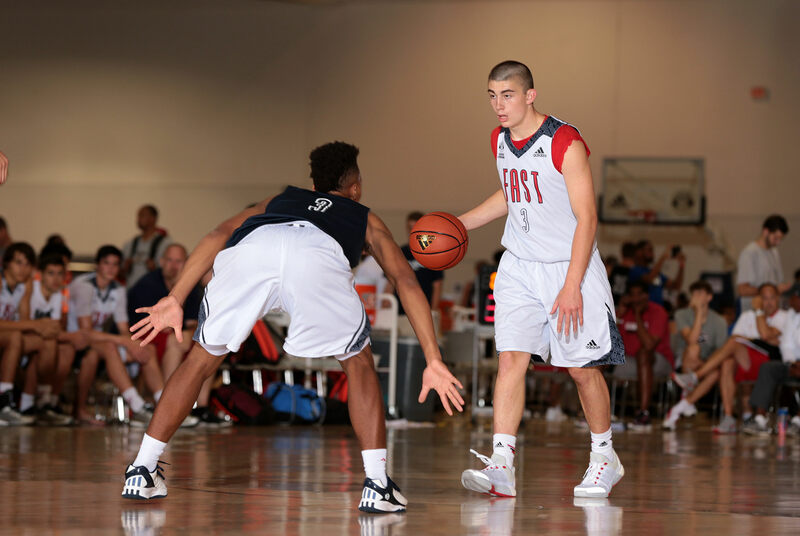 Pritchard, a top-50 recruit, recently decommitted from Oklahoma and is back on the market. Wisconsin, Oregon, Louisville, Kansas, California and Arizona State are among some of the other schools involved in Pritchard’s recruitment. The talented lead guard had drawn interest from Michigan early on in his recruitment, but ended things quickly when he chose Oklahoma. He plans to take his time this time around and use all of his visits. Miles Bridges recently trimmed his list to five schools and according to a report by MLive.com, he’s already set three official visits. Bridges will visit Indiana on August 28th, Michigan State on September 12th and Kentucky on October 16th. He’s yet to finalize dates for trips to Michigan and North Carolina. Bridges had been considering transferring back to Flint for his senior year, but he wil stay at Huntington Prep according to his family. The Hype Athletic Center isn’t the Davidson Player Development Center, and their lighter baskets were in dangerous all tournament as Davis was doing chin-ups like it was boot camp. His fitness level is high and it shows in how active around and frequently above the rim he was. U-M’s head coach John Beilein and posts coach Bacari Alexander were at the event, and had to be excited with what they saw from Davis. Davis is in Las Vegas this week at the Adidas Uprising and is averaging 10 points and six rebounds per game with the Michigan Mustangs. Ibi Watson has blown up on the national radar this July, but it doesn’t appear that he’ll wait long to make a college decision. The 6-foot-6 wing is considering deciding as soon as the end of July and he’s already scheduled a follow-up visit to Indiana, who offered last week. Michigan appears to be one of the primary schools that could adjust or complicate Watson’s decision making schedule. Bacari Alexander watched Watson on Wednesday evening. John Beilein watched Te’Jon Lucas in Las Vegas after catching quite a few of his games last week. Beilein was joined by several other head coaches checking out the talented lead guard. Michigan is one of four schools recruiting Kevin Huerter the hardest, along with Notre Dame, Syracuse and Maryland, according to his AAU coach. 2018 point guard Darius Garland has offers from Memphis, Vanderbilt, Tennessee, Baylor and Wake Forest with interest from Kentucky, Duke, Michigan and Michigan State. Beilein also checked in on the Michigan Mustangs 16U group.